Fall is the prime time to fish for most fish species in Wisconsin. The days are getting shorter and the water is cooling down signaling that winter is not that far away. It’s the time of the year when fish feed heavily to carry them through the winter when their metabolism slows down and for female fish the heavy feeding will help in their egg production for the spring’s spawn. It’s a great time of the year to be on the water for some of the biggest fish of the year and also most bodies of water are not crowded giving you the water to yourself. I’m going to give you some top locations and tactics for catching fall salmon, muskie, walleye, smallmouth, and northern pike. Chinook salmon make their fall migration to shallower water and the numerous harbors that dot the Lake Michigan shoreline in October and November. These are the 4-year old fish that are completing their life cycle. You’ll find 2 and 3 year old fish, but the vast majority of the salmon are the 4 year olds that are changing color as they reach their life’s end. 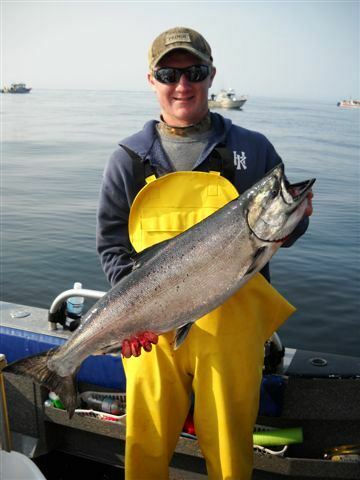 Anglers can catch salmon in the harbors and off the piers from Racine to Sheboygan. The top salmon choice is the Sheboygan area, where anglers can catch fish off the North and South Piers or fish the harbor area (the Gap) in a boat. The pier techniques are two-fold; an angler can cast and slowly retrieve spoons and crankbaits. The best spoons to use are Little Cleo’s and Crocodiles in green, glow, and chartreuse. Salmon can also be caught by casting Rapala’s, Fastracs, and Junior Thundersticks. The other proven tactic is to soak spawn sacs just off the bottom while using a #4 red treble hook attached to the sac. Use styrofoam balls or marshmallows pinched to the hook eye to keep your bait off the bottom. Boat fisherman can slowly troll spoons, crankbaits, and spawn sacs in water 15 to 30 feet deep. The “Gap” which is located between the piers is where you want to fish if you’re in a boat. The best place to check on local conditions is at the Wharf (920)-458-4406 which is located right at the harbor or contact Captain Doug Rood at (920)-980-3339 or email him at captaindoug@rooddawg.com. Fall to many anglers means muskie time! Trout Lake holds numerous muskies in the 30 pound plus range. The lake is in Vilas County, just south of Boulder Junction east of Highway 51 and west of Highway M. Its depth (115 feet) and size (3870) can make it a difficult lake to fish on a windy day. But, Trout Lake is loaded with structure and big muskies and walleye too! Trout Lake deserves its trophy reputation. Big baits like the Smity or Eddie jerkbaits work well as do bucktails. The best colors are black, yellow, and your natural colors. There are many deep drop-offs, so a weighted bucktail or deep diving crankbait can help put your bait in the zone. 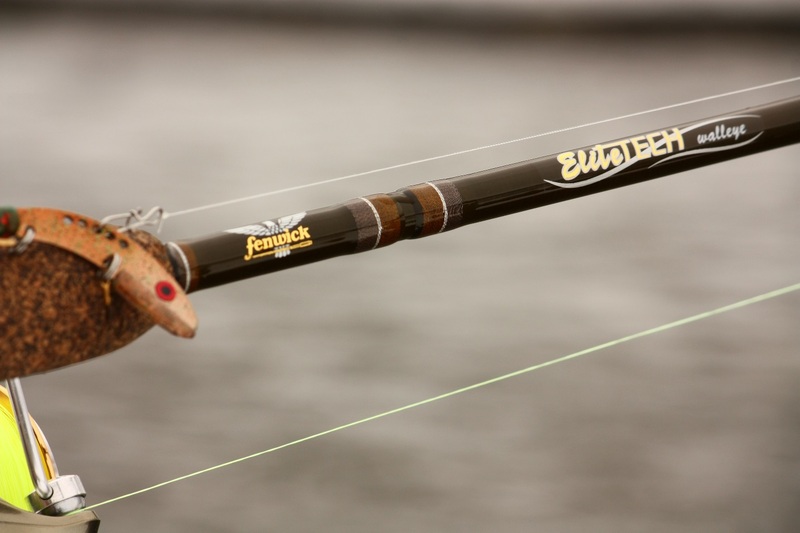 Also, always have a good-sized black sucker (12-16”) on a quick-set rig close to the boat for follow ups and always do a figure eight close to the boat on your retrieve. The south-east shoreline of North Trout Lake before the “Narrows” because it has numerous rocky and steep breaklines. Cast parallel to the breaks with bucktails and deep-running crankbaits. Both shorelines going through the “Narrows” have deep breaks that will hold muskies. Be sure to cast both sides thoroughly. 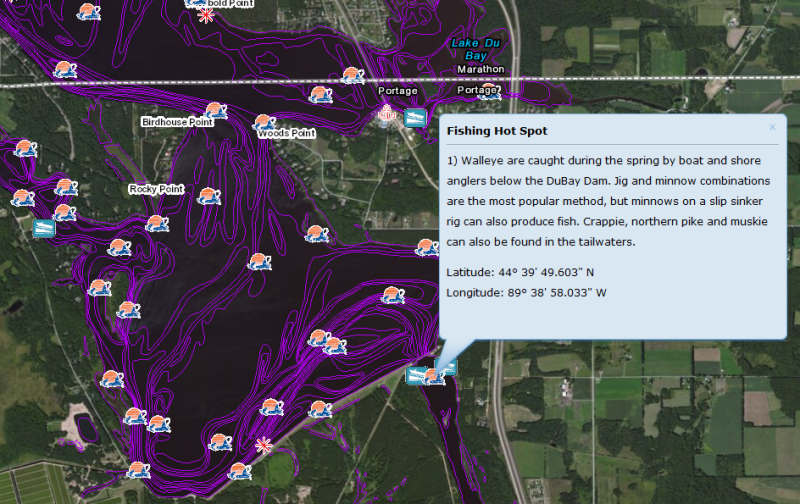 Work around South Trout Lake islands (Miller, Haunted, and Zimmerman) because of the ideal bottom structure that attracts muskies in the fall. 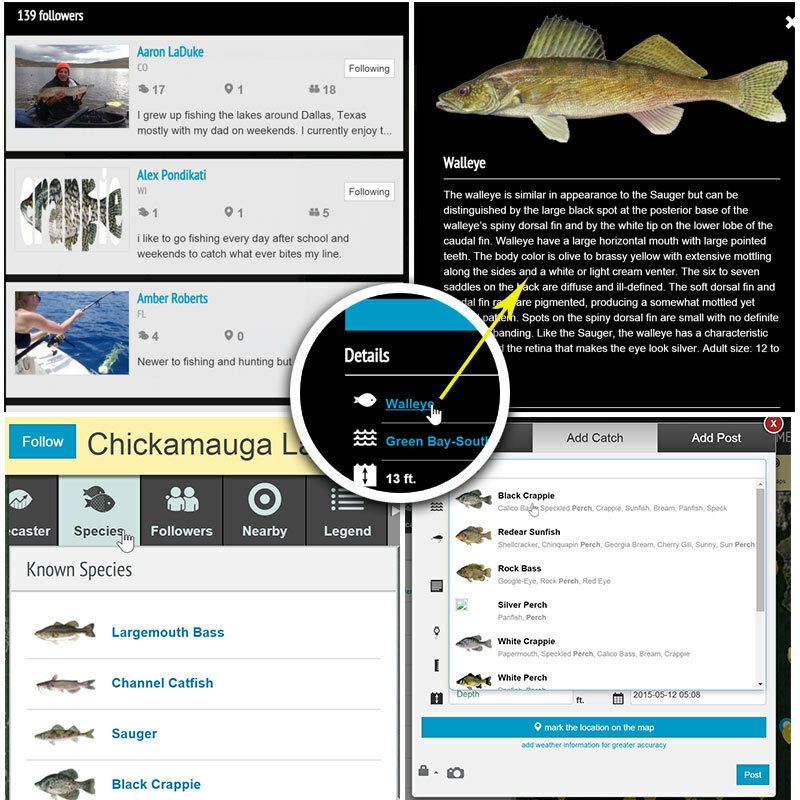 Good electronics and online resources like Fishidy are important because Trout Lake has structure that can vary dramatically. There are numerous submerged islands, reefs, rock bars, underwater points, and steep drop-offs that quality electronics can help you find. I’d suggest Russ or Jake Smith as guides (715-356-5565) for Vilas and Oneida Counties. 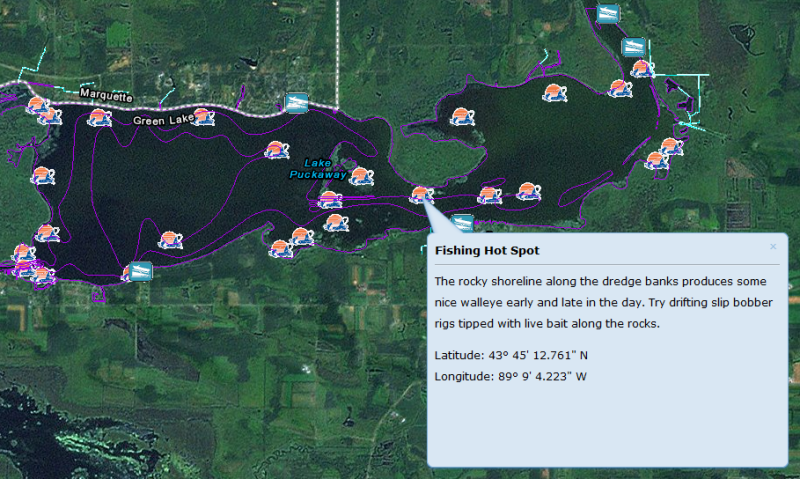 The area around the Dubay Dam at the south end is a good bet for walleyes with deep water and sand flats being close by. In the middle of the lake, there are three distinct “stump fields” One is just south of the boat landing off Highway 34, another north of Koss Point, and the third is north of Goose Point. The flowage has a distinct river channel which should be fished along with the abundant timber and wood. The lake lacks weeds, so wood is the main structure. The best way to catch fall walleyes here is the standard jig and minnow combination with blue and glow being the best colors. Casting jigs with plastics (Gulp) also works well when casted and retrieved very slowly. Try trolling the channel edges with bright-colored crankbaits (Shad Raps, Mann’s Stretch 5’s, and Wally Divers). Trolling lead core also works well year-round. Lake Dubay is less than 100 miles from Madison, 10 miles from Stevens Point, and 120 miles from Milwaukee. Good guides are available at Hooksetter’s Guide Service and Phil Schweik, (715)-693-5843. Phil and the other guides know the area well and will put you on fish. 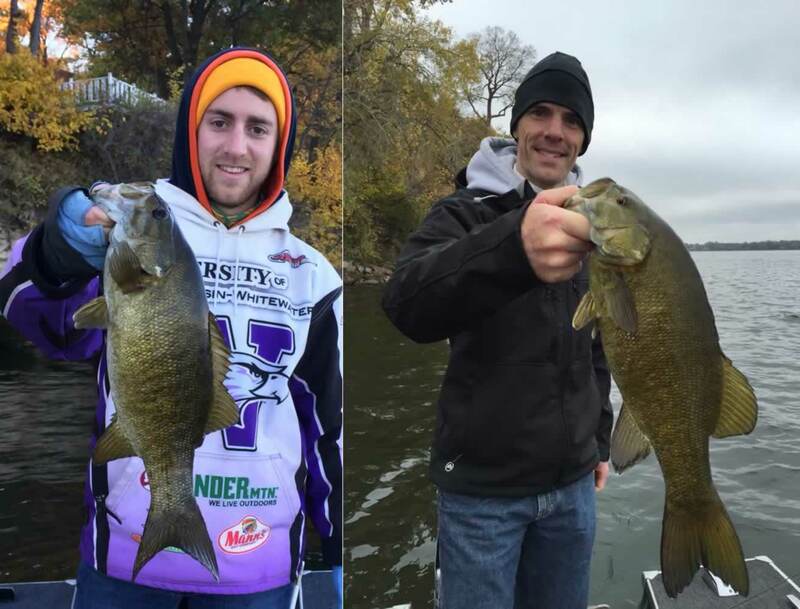 Madison’s Lake Mendota is the fall pick for smallmouth bass. This lake is again large (10,000 acres) and deep (90 feet). Lake Mendota has structure and an excellent smallmouth fishery that is rarely fished in the fall. The lake has numerous points, rock bars, islands, and sharp contours that smallmouth love. The later in the fall that you fish Lake Mendota, the better the fishing is. Once the water gets below 55 degrees, smallmouth will start feeding heavily. 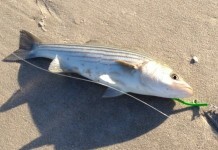 Live bait will catch you the most fish, but you can end up gut-hooking too many fish. If you use big minnows (chubs, fatheads), set the hook quickly before the bait is swallowed or use a circle hook to prevent killing the fish. Good guides are; Tony Puccio, (608)-212-6464, Ron Barefield, (608)-838-8758, and Wally Banfi, (608)-644-9823. The steep drop-offs near Governors Island where the water can quickly go from 10 to 70 feet. Jig up and down the steep breaks. Work the contours and breaks off Maple Bluff and Warner Bay while concentrating on depths from 5 to 20 feet. Fish off Picnic Point and Second Point on the lake’s south end. There are numerous humps and bars off these points to go along with deep water. Rocks are the fall key on Lake Mendota and most lakes in the fall. As the fall progresses, smallmouth will move shallower. Smallies go on a feeding frenzy before the really cold water sets in and then they go pretty much dormant. 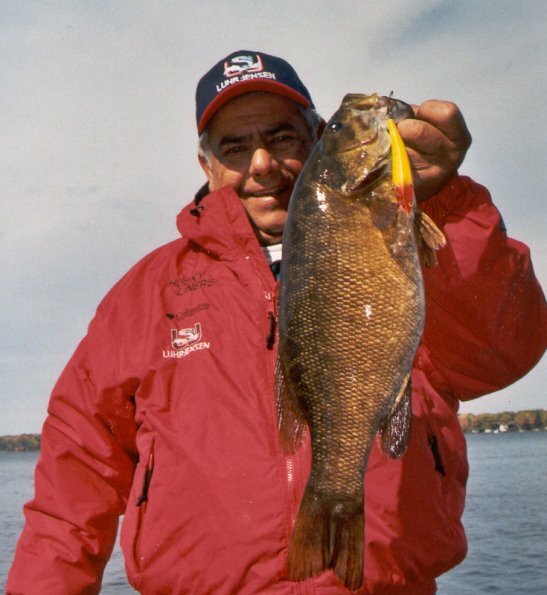 Lake Mendota allows trolling, so pulling large crankbaits can also mean big smallmouth. 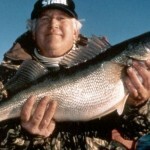 Contact Gene Dellinger at D and S Bait and Tackle at (608)-241-4225 for the latest information. 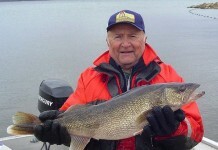 Gene also guides and is always on top of the Lake Mendota fishing. Madison is only 70 miles from Milwaukee, 125 miles from Chicago, and 70 miles from Rockford, Illinois. 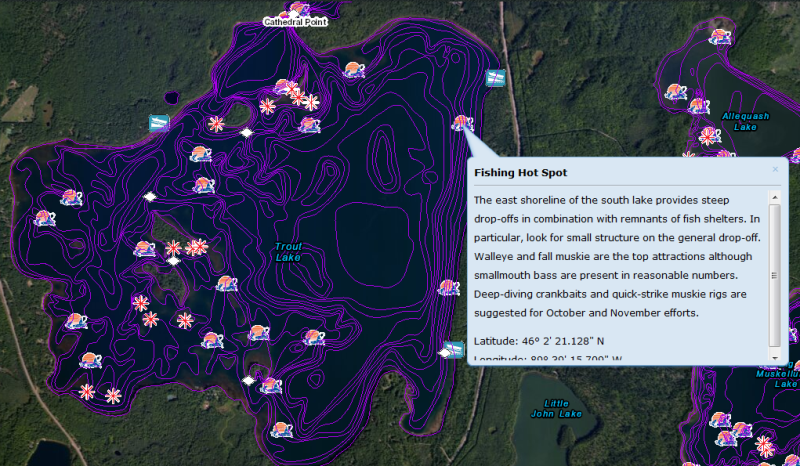 My top location for fall northern pike is Lake Puckaway. The shallow water lake is large with over 5,039 acres of water. The stained water has a maximum depth of only 5 feet, but it contains both numbers and large pike. The state record northern pike (38 pounds) was caught here in the 1950’s. Fish over 20 pounds are always possible and caught every year. The trophy potential on this lake has been maintained with a minimum size of 32 inches and a 1 fish daily bag limit. Professional angler and guide, Daryl Christensen, (608-296-3068), from Montello says that the best fall locations are in the Fox River area and the whole west end where the Fox River enters the lake. The reason why this is a top location is because the shad forage base moves into the river to spawn. Fish any green weeds with spinnerbaits and crankbaits in white, black, and orange colors. Christensen said to follow the scattered weed edges along the west shoreline when casting. Daryl also said that the big fish that you see in the weeds are not carp, but big pike! Big spoons casted and quickly retrieved catch pike and the odd muskie. Lake Puckaway is located in Green Lake County about 75 miles north of Madison. Take Highway 51 north from Madison till it runs into Highway 22 and continue to Montello. From Montello, take Highway C to the lake. Contact Holiday Shopping Center, Montello, WI. (608)-297-7170 for bait, licenses, and information.